Before reading this article, I recommend that you to go through the previous articles of this series (see the TOC at the bottom), to understand the concept of the SQL Server Audit, the reasons behind auditing the SQL Server instances and databases, and the different methods that can be used to audit the SQL Server databases. In this particular article, we will discuss how to perform SQL Server database tables audit using Change Data Capture. Change Data Capture, also known as CDC, introduced the first time in SQL Server 2008 version, as a helpful feature to track and capture the changes that are performed on the SQL Server database tables, with no additional programming efforts. Before SQL Server 2016, Change Data Capture could be enabled on a SQL Server database only under the SQL Server Enterprise edition, which is not required starting from SQL Server 2016. Change Data Capture tracks the INSERT, UPDATE and DELETE operations on the database table, and records detailed information about these changes in a mirrored table, with the same columns structure of the source tables, and additional columns to record the description of these changes. SQL Server writes one record for each INSERT statement showing the inserted values, on record for each DELETE statement showing the deleted data and two records for each UPDATE statement, the first one showing the data before the change and the second one showing the data after performing the change. Note: See Monitoring changes in SQL Server using change data capture for more information about CDC. This detailed information makes it easier to monitor the database changes for security or auditing purposes, or incrementally load these changes from the OLTP source to the target OLAP data warehouse, using T-SQL or ETL methods. Change Data Capture requires that a SQL Server Agent is running on a SQL Server instance. When the feature is enabled on a SQL Server database table, two SQL Server Agent jobs will be created for that database; the first job is responsible for populating database change tables with the changes information and the second job is responsible for the cleaning up the change tables by deleting the records older than the configurable retention period of 3 days. 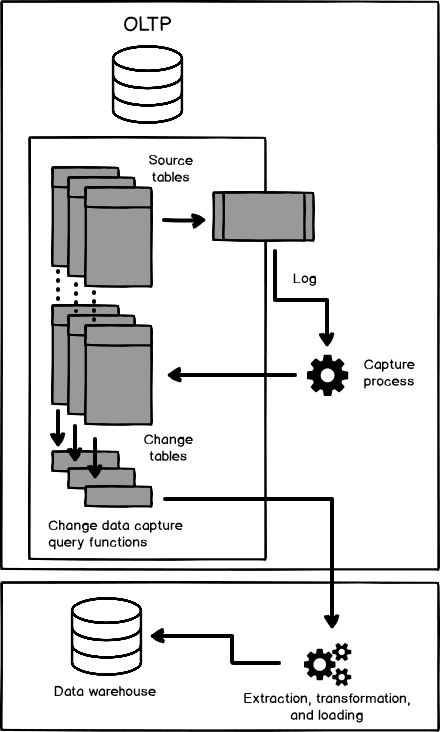 Change Data Capture depends on the SQL Server Transaction Log as the source of the data changes. When a change is performed, this change will be written to the Transaction Log file. Check SQL Server Transaction Log Architecture for more information. Change Data Capture can be used as an asynchronous SQL Server Audit solution, to track and audit the table’s DML changes, such as INSERT, UPDATE or DELETE operations, with no option to track the SELECT statements. What makes Change Data Capture a good SQL Server Audit solution is that, it can be configured easily using few T-SQL commands, it provides historical information about the values before the modification process and provides detailed information about the data modification process. Let us see how we can use the Change Data Capture to audit the SQL Server DML changes. Change Data Capture can be easily used to audit only the database DML changes, albeit it with no option to monitor SELECT statement, with the negligible configuration effort. On the other hand, to consider CDC as a SQL Server Audit solution, it requires significant maintenance and administration effort. This includes automating an archiving mechanism, as the tracking data will be kept in the change table for a configurable number of days and will be stored in the same or different data file, that should be also monitored and maintained. In addition, the change tables will be stored under each database, and a function will be created for each tracked table. This makes it cumbersome and requires significant programming effort to create a consolidated auditing report that reads the DML changes information from all tables under the same database, from all databases under the same instance, or cross multiple instance. Another limitation for CDC feature as a SQL Server Audit solution is difficult process that is required to handle the DDL changes on CDC enabled table, as having the Change Data Capture enabled on the source table will not prevent performing DDL changes on that table. Also, if the SQL Server Agent service is not running, CDC capture job will not work, and the database log file will grow rapidly, even if the database recovery model is Simple, as the log truncation will not advance, even if a CHECKPOINT is performed, till all the changes that are waiting for capture will be gathered by CDC capture process. In the next article, we will discuss how to audit the SQL Server instance using the Change Tracking feature. Stay tuned!